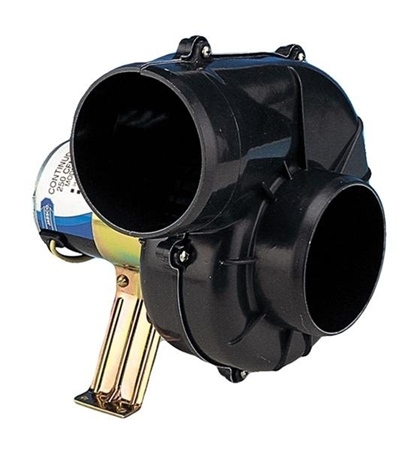 -Continuous duty 100mm (4") blower, flexmount 24 volt dc. -Connections: – for 100mm (4”) ducting. -Dimensions: - 230mm long, 250mm high, 240mm wide. -Fuse Size: - 10 amp. -Maximum Current: - 6 amp. -Output: AIR FLOW- 7 cu.m/minute (250 cu.ft/minute). -High volume intake or extraction blower for engine room duty on commercial vessels, charter yachts and other heavy-use installations. -Flexible mounting permits 360º adjustment of outlet direction.